As is tradition now, Focus Home Interactive was one of the big appointments we had booked at E3. This year, the main theme seemed to be horror, as three of the titles that we saw were pretty invested on gloomy atmosphere and the macabre. Shifting away from the psychological horror of Call of Cthuthlu to something much closer to home, it looks like A Plague Tale: innocence is sure to play with everyone’s inner fear of rodents; then again, you’ll need them if you have any hope to survive. Set in medieval France during the height of the Black Plague, Innocence is a third-person action-adventure game starred by Amicia and Hugo, two siblings who are trying to make a living among all the troubles brought by disease and the Inquisition, who just happened to set up shop in town. Neither sibling is very versed in combat, but thanks to the constant presence of rats over any surface not directly under a light source, they’re able to make due and open up paths by manipulating the disgusting flood of sickly furries to attack any enemies that happen to be in their way. The visual cue for the rats is downright creepy: a constantly moving pool of living creatures that is absolutely lethal to anyone who sets foot within their grasp. The whole concept already made my skin crawl the first time I heard about this game during last year’s E3, but seeing it in action was enough to make me feel pretty disconcerted. The short section of gameplay showed Amicia putting out a light that was protecting two knights guarding a church-like building. That immediately cleared their way, but not before we had to watch the two hapless fools scream their lungs out as they got eaten alive. Disturbing imagery, for sure. Upon getting inside, an example of the cooperation between characters came into play, as the smaller, more nimble brother was able to climb under a barred door which protected a torch. There wasn’t much more shown in the way of having the siblings interaction during this presentation, though, so it’s still up in the air how involved it will be in the final version of A Plague Tale. 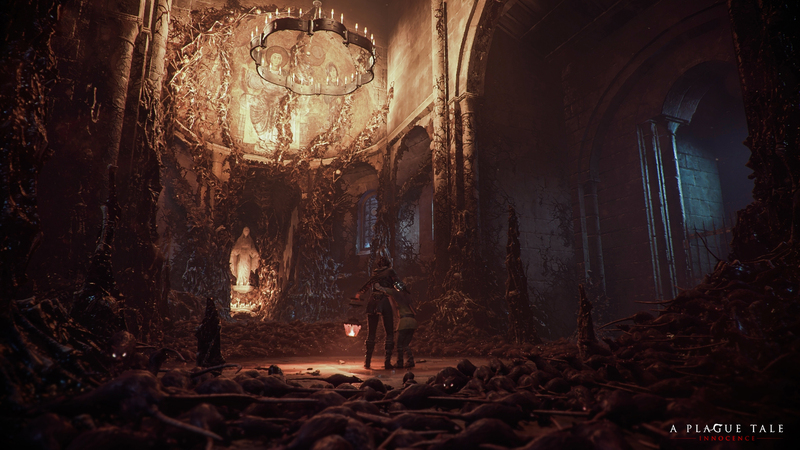 The core concept of using light to clear a path is nothing particularly new — that annoying section with killer bats in the original Gears of War springs to mind — but having an entire game focused on it makes A Plague Tale feel relatively fresh. Hopefully there’ll be more depth than simply finding clever ways to get from point A to B aside from the aforementioned ambush. The developers running the demo subtly confirmed that you won’t always have direct control over light sources. Maybe the weather could somehow come into play, like lightning? Who knows. Asobo was very tight-lipped in regards to any other details, so there’s still a lot to A Plague Tale: Innocence we don’t know about. That also includes its release date, which is currently listed as ‘to be announced’ for consoles and PC.